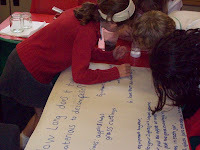 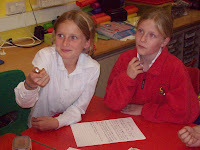 Earl Soham Community Primary School Blog: Let's Write! 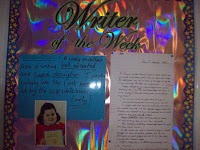 We've also introduced a 'Writer of the Week' for each of the three classes. 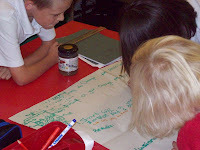 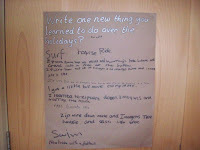 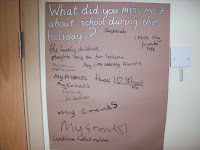 There is a separate section on the school website with more pictures and pupils' writing. 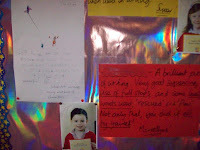 Our first three 'winners' work is pictured below (click on the pictures and they will fill the screen) on the new display area. 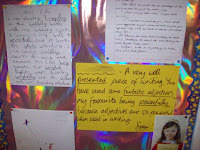 Their work is enlarged and commented on as to why it was chosen, their photo taken and a new certificate awarded - 'Writer of the Week' badges are on order!